It’s an amazing party like nothing you’ll see anywhere – not Sundance, Toronto, Berlin, Venice, nowhere. It’s everyone in World Cinema and the European industry combined with everyone in the US industry, combined with super super stars, combined with international wealth that one doesn’t usually see (arms dealers, for example), with huge yachts on the harbour, sparkling at night along the Croisette, and folks decked out in Chanel, Dior, Gucci for the premieres (black tie only, and its very cool as you walk down the red carpet and it all seems so celebratory! For film!). 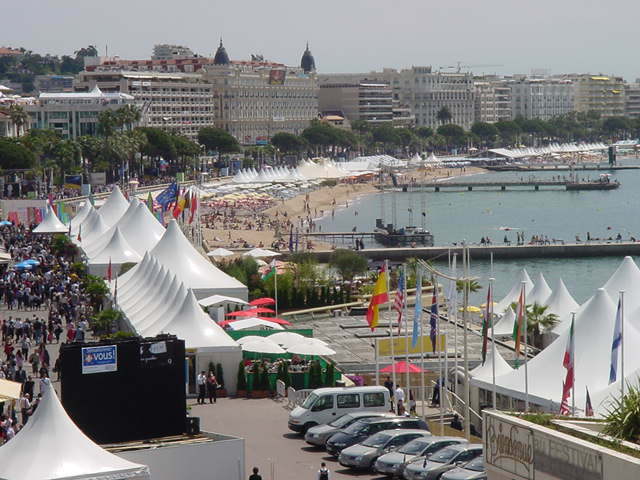 The main gig is along the Croisette (the main road, bordering the water) with Old Town providing the places for nice, relaxed dinners, and the beaches farther along the harbour for those who want some ‘peace.’ And most of the action that’s not private happens behind the “Grand Hotel”. It’s a lot of fun and it’s gorgeous. I enjoyed the work and the partying, but it was exhausting. I felt like I had Rose wine streaming through my veins by the time I left all times. However, it is impossible to get into parties, on the beach, in the villas up in the hills, on the boats, anywhere, without being on guest lists, and it’s near impossible to get into most films without a pass, and absolutely impossible to attend a premiere unless you know a distributor who can give you an invite, or you go with an A-list star. The villas, the parties on the beach, all heavily guarded, as are the premieres, where even if you do have a ticket, you may not get in and it’s a real mess (see A-list bringing an entourage and over-issuing to insure packed houses). It’s gorgeous, blue sparkling, French Riviera, and its silver-coloured sea with the sparkling lights at night… However, even when you are working, or are with an ‘important’ person, or are ‘beloved’ by those you’re around, everyone is always looking over your shoulder as they talk to you, and around the room, to see who else is there, eager to make that next important contact, that next big impression. Overall, it’s exhilarating in the setting of the silver, sparkling sea, and all the commotion about film when you are a lover of film, even as it’s also heartbreaking.